Mother’s day is just around the corner, this year it’s on 30th March, which gives you plenty of time to make something special for your mum. 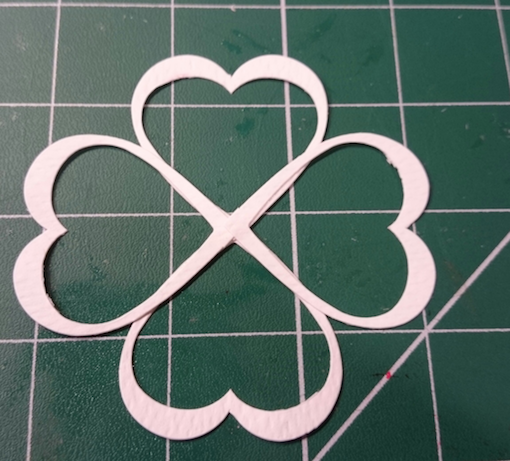 Separate 4 heart Diecuts into the 12 hearts, with a bone folder and curl slightly. Using the 4 largest hearts, and the 2cm wide circle, cover the circle with doubled sided tape and stick the hearts together as shown in the photo. Stick the middle sized hearts together with Silicone Glue and fine nib as show on the photo. Layer the medium hearts on top of the larger hearts, rotating by 45 degrees to create a floral effect. 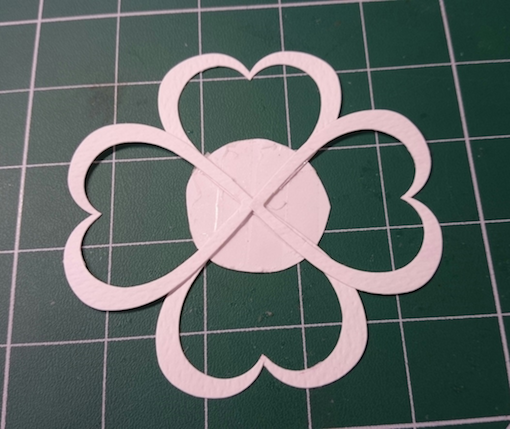 Stick together the last 4 full hearts and add this to the centre to create the middle of the flower. Layer on top of the other two layers of hearts. Punch 2 black flowers and stick them on top of each other using the silicon glue. Attached this to the centre of the white flower you have just created. Add a gem if you wish. 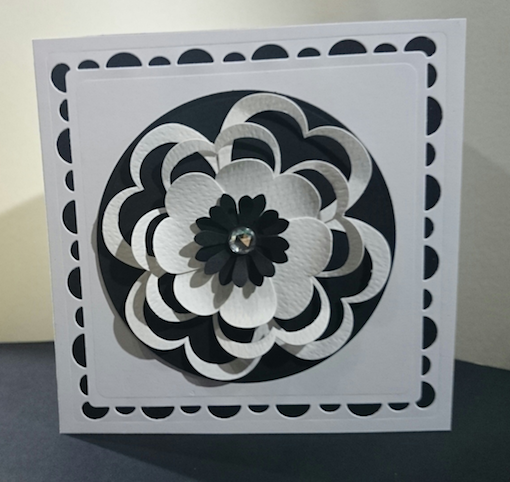 For this card we used a tonic square base affections die shape and a circle of black card to create a background for the flower. If you don't have a die cut background you can improvise and create your own. Thank you all for coming to see us at this year's Spring Stitches. It is great to see you supporting our business and products. Over the years, many of our customers have become loyal members of our crafting community. Our new product Layer Perfects was a big hit with customers as well as products. 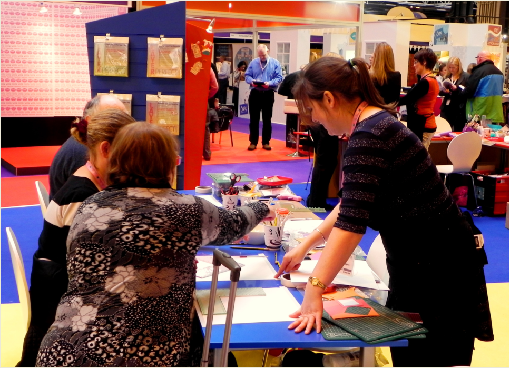 Emma, one of our demonstrators was extremely busy demonstrating different techniques to use the Layer Perfect Tool. Karen’s Make and Takes were also a huge hit and their demonstration table was rarely empty. Karen was showing how customers to make some simple but beautiful bookmarks and gift tags using both old and new products allowing you to get a first-hand experience of using our products and expert knowledge. While at Stitches, Michelle was on hand to answer any questions you had about our products (here she is showing the wonders of the Adhesive Remover). Michelle also lead three workshops which, from the feedback given by those who attended, were extremely successful and helpful while being fun at the same time. It was great to see you all at Stitches and hope you had a great an experience as we did. Now we are back at HQ we will get in touch with all our customers both old and new also those who couldn't make stitches to make sure you have a copy of our fantastic new brochure and how we can help in 2014. We had a wonderful response to our new products that are all available to view on our website here and look forward to discussing them with you. Mother's Day is slowly approaching and will be with us soon. 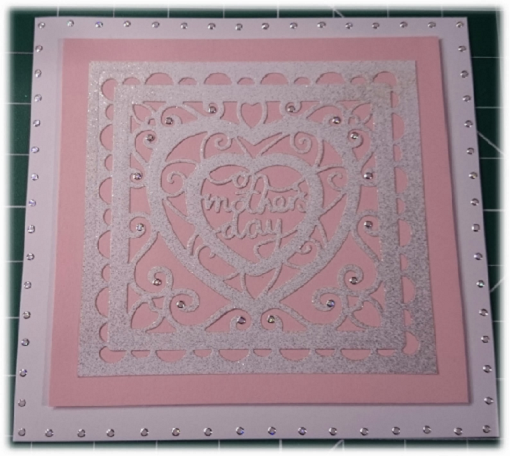 Here is a fantastic idea to create your own card for Mother's Day. Cut a 6" x 6" white card out, use the Verso dies nesting inside each other to cut frame out for the centre of the card & layer it up on a 7" x 7" pink card. Using the Layer Perfect go round the white 8" x 8" card marking every other hole in the Layer Perfect tool & place a gem on top of each mark to make a lovely border. 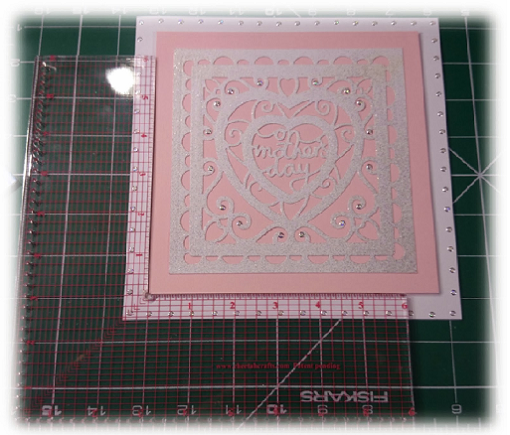 Using the Layer Perfect , layer the pink card on top of the 8" x 8" card using your craft foam pads. Stick gems on to decorate. "I Love You" a little more special. Fold the white card in half to make the tag. Layer up the red and dotty red card onto the white tag using your Layer Perfect to create an even border and the Tape Runner to make this secure. 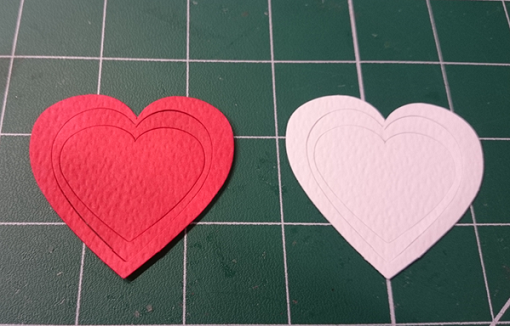 Take two Diecut Hearts and using the middle size colour this with the Promarker. 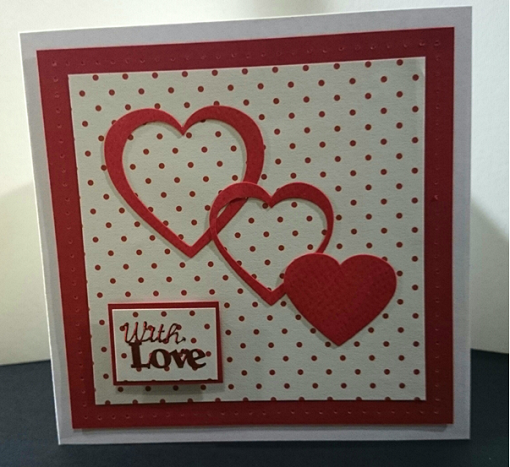 Stick the 2 hearts on the dotty paper using the PVA Glue with a fine nib. Place a strip of Double Sided Tape on the back flap so it can be attached to the gift when required. Add gems if you wish. 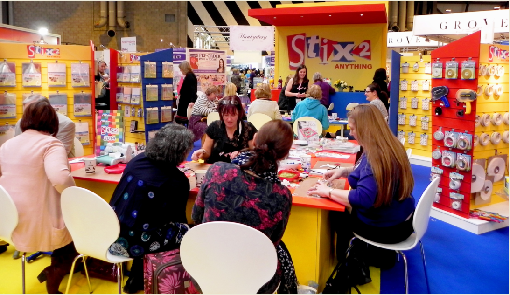 Next week Stix2 are attending Craft Hobby + Stitch International,Europe's No1 creative craft trade show. We will be show casing all our products here so come and visit us on Stand F06. For 2014 we have launched some amazing new products you can come and view while watching (and joining in with ) our demonstrators showing how best to use them along with tips and tricks on how to use our other products such as the Hot Melt Glue Gun while creating projects of your own. For the entire event our dedicated team are always on hand to help with any questions, queries, orders, event related offer or questions. On Sunday at 10am and 5pm our Demonstrator Michelle will be leading a fantastic workshop show casing our brand new Layer Perfect in the main work shop and again at 5pm on Monday. Book your place here to join in. Directions to NEC Birmingham can be found here. Register NOW to not miss Stix2 at Craft Hobby + Stitch International. A great idea to show someone how much you care. Cut a 5.5" square in red card. Cut a 3.5" inches square in the dotty red paper. Take 1 heart Diecut from the Stix2 packet and colour it in with a red Promarker, then separate it into the 3 Diecut hearts. Take your Layer Perfect Tool and place it round the edge of you red card and with a pokey tool poke through the holes at the edge of the ruler to create a nice pattern round all 4 sides of the red card. Layer you red and dotty red card on your 6" x 6" white card using your Layer Perfect to get a perfect and exact border and position. Secure in place using the ultra clear double sided tape. 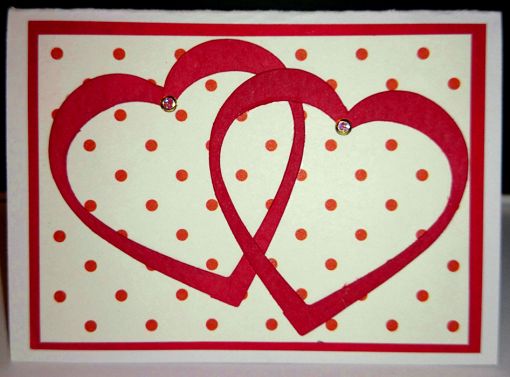 Stick your 3 hearts on your red dotty paper as shown on the card using the silicone glue with fine nib. Add a greeting of your choice and mount using the foam pads.